On June 15, electronics giant Matsushita Electric (Panasonic's parent company) unveiled a wearable robot suit called Power Pedal, which attaches to the lower body and provides users with up to seven times more leg strength. Once strapped in, the user applies pressure to a pair of sensor-equipped pedals to control the suit, which is capable of moving in one of six directions with each step. Power Pedal is also designed to handle strolls over rough terrain, according to Matsushita. Researchers from Active Link, a Matsushita venture company, worked with Ritsumeikan University to develop a prototype of the powered suit, which is set to go on sale in August at a price of 20 million yen ($167,000) each. The company plans to cut the cost to around 3.5 million yen ($30,000) by the year 2015, as they aim to create a commercial product that can help the elderly and disabled to walk. 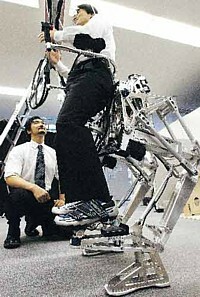 Matsushita also believes the robot suit could play a useful role in disaster relief operations, especially if combined with the company's previous upper body robot suit technology developed in 2005, which is designed to provide users with an extra 50 kilograms (110 lbs) of arm strength. Panasonic Electronic Devices (subsidary of Matsushita Electric Industrial Co., Ltd.) announced on March 29 that it has teamed up with Doshisha University to develop speaker diaphragms using paper made from bamboo. Compared to speakers with conventional diaphragms that use paper made from softwood, bamboo speakers have a wider sound range and crisper treble. 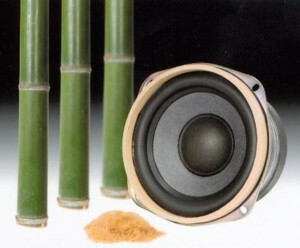 Bamboo is lighter and harder than softwood, making it a suitable material for speaker diaphragms. To maintain the ideal properties of bamboo, high-speed grindstones are used instead of chemicals (which can cause some properties to be lost) to break the bamboo down into fiber. Panasonic hopes to put the speakers on the market at the end of 2007. The speakers are expected to cost double that of conventional speakers, but the company claims that using bamboo can play a role in resource conservation because it grows faster than softwood. The company hopes to establish bamboo as a mainstream material for speakers.